Green Cardamom | Add Fabulous Flavour to Curries, Coffee and Ice Cream! 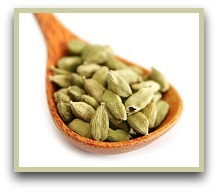 Green Cardamom - Tastes Great in Coffee, Curry and Even Ice Cream! People have been growing and using green cardamom (Elettaria cardamomum) in a variety of ways for at least 4000 years! Whilst today we mainly use it in our recipes, throughout the ages it was being used for ceremonial, medicinal and ritualistic purposes as well as in the cooking pot. Even today, it's still used in traditional medicine in various parts of the world. In South Asia it's used as a treatment for stomach and digestive problems and as a cure for gum and mouth infections. Today you'll find the bushy plants growing wild in the rainforests of the Cardamom Hills in southern India and cultivated in places from Nepal and China to Guatemala amongst others. Read more on the history. Cardamom plants are delicate shrubs, so the pods have to be hand picked and sorted then left to dry in the sun for a few days. This is obviously labour intensive and the reason that, after saffron and vanilla, cardamom comes third on the most expensive spice list. But don't let the price put you off, as a little goes a long way. A small jar lasts me a good few months, and I use it more than most. Buy whole pods not the pre-ground stuff, as once opened and ground the tiny seeds rapidly lose their essential oils. The easiest way is just to throw them in whole, which will very lightly flavour the food. Rice dishes always benefit with a few thrown in. If more flavour is called for, crack them open first and add to the recipe and the seeds will dissolve whilst cooking leaving the husk which you can remove and discard. 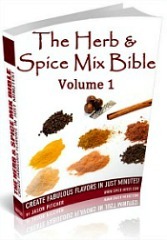 If you make your own spice mixes, crack the pods and take out the seeds before grinding. 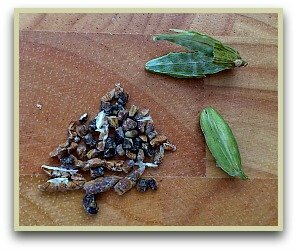 Some popular blends that use green cardamom include Ethiopian berbere, the popular North African ras el hanout and many a garam masala recipe. Nowadays green and black cardamom pods are used pretty much all over the world. The Indians and Sri Lankans use them in complex curries and rice dishes and to flavour tea and even the Indian ice cream kulfi. And thanks to the Vikings discovering it a thousand years ago, it's also very popular in Germany and Scandinavia, where it's used for cakes, bread and meatloaf. You'll also find it in the fabulously named mulled wine "glogg", a traditional Christmas drink. And let's not forget cardamom coffee, an extremely strong, sweet brew popular throughout the Middle East. A good way of enjoying the benefits of the "Queen of Spices", is to brew a potent tea from the seeds. This tea is often used in Asia for health and medicinal purposes. Click here for my recipe.